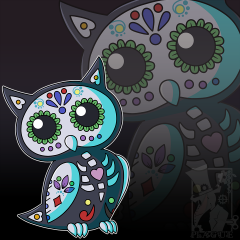 A cute little Day of the Dead owl I recently finished up. Thought it might be fun to share with everyone here. Greetings lost wanderer ! Soooo , for the past weeks , I have spent time drawing a few arts in order to develop my skills but then a major blockup came across my path , I am unable what art style to use . So the questions are : - Is it ok to have multiple art style instead of just one? I feels like , sometimes , an art style can be specific to one artist and can even portray their signature , but I cannot be satisfied with only one art style ! Therefore , would it be ok this way ? - Among those five drawings-drafts ( I actually have a dozen other art styles but I only used four of them with my graphic tab so far .) which one do you actually prefer ? 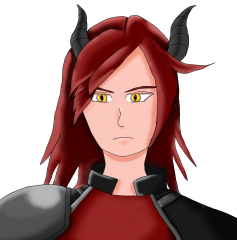 First artstyle is almost chibi-like with minor shading but a slightly wider color palette for the hair . Its sketchy and colors are solid. Unlike other artstyles , legs are not very realistic and goes from thinner by the thighs to thicker by the feet : Second artstyle (I have already published on another topic , I do know) , the artstyle is not chibi-like but not too realistic either . It's simplistic but has a bit of details . Proportions are more anime-like with bigger eyes , bigger head , droopy shoulders , very round features and structure . It has shading and a bit of lighting for the hair. The "outer" outlines are black but the "inner" outlines are lighter and the color is closer to the filling : Third artstyle is a closer aspect of the anime style but still in a cuter art style . There are a bit more details , minor lighting for the hair and shading . The "outer" outlines are black but the "inner" outlines are lighter and the color is closer to the filling : Fourth artstyle is a more realistic in proportions . It has less lighting effect but has a more detailed shadowing ( I guess ) and more details . The outlines and the shading are sometimes a bit smoothed down on the ends . The "inner" and "outer" oulines are both black : Fifth artstyle is quite similar to the third one but with a cuter aspect and the head is even bigger than the body . It has more shading ( there is one shading for the part that is facing the light , and a shading for the part that is hidden from the light source.) It has a bit of details but it is mostly for the eyes and the patterned areas . The "outer" outlines are black but the "inner" outlines are lighter and the color is closer to the filling : Thank you very much for taking your time to read this post . It is greatly appreaciated ! A picture I drew of my character Chibae for a game I working on Really proud of how she turned out. It's not completely finished because I'm having trouble knowing how to shade it. What do you guys think so far? Its a art thread. Soon to be updated right here. â€¢â€¢â€¢ I n t r o =========================================================== â€¢â€¢â€¢ C o n t e n t s 2 key rules for drawing a male body Comparing a female vs. male face -pt.1: Looking at the anime Bleach's female vs. male protagonist, turning a girl into a guy Comparing a female vs. male face -pt.2: Differences in shading; the effects of makeup Comparing a female vs. male torso: More shapes Comparing a female vs. male limb and hand: Basic look =========================================================== 2 key rules for drawing a male body: Comparing a female vs. male face - pt.1: Comparing a female vs. male face -pt.2: Comparing a female vs. male torso: Comparing a female vs. male limb and hand: =========================================================== â€¢â€¢â€¢ S u m m a r y Males have broader features than females. This is because men have less Estrogen, making not only eye size differ, but also jaw, mouth, brow, and general bone size, + fat amount. Males' features are more cuboid than females. Therefore, they're shaded more cube/ rectangular-like than females. Males' frames are ~3 heads wide, and can be simplified into an isosceles triangle or two trapezoids and a circle/ rectangle. A male's torso should form an equilateral triangle from the shoulders to the navel. Males' legs tend to be less curvy/ smooth. Similarly, their hips tend to be less curvy and more slim than females'. Hopefully this helps someone. Last updated June 3rd, 2014. Last updated September 21st, 2015. 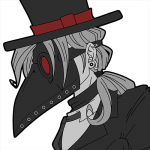 Welcome to EpicFILE Drawing Stuff! (I think I'm gonna change the topic name later because it doesn't sound really good...) It's been a while since I'm doing serious drawing. Recently I play Soul Calibur... IDK why, it makes me want to draw again. xD (Maybe because its great arts... Or fancy costumes? It opens up my inspiration traffic anyway) Here's a picture I made today. Well, originally my foray into the world of graphics design wasn't with the intention of making stuff for RPG Maker. It began almost ten years ago, in which I wanted to be like some other cool 'GFX Artists' at the time who were able to make themselves awesome tags for their signatures. From there, I went on to working on wallpapers, splash pages and all kinds of other stuff. I haven't actually been at this a solid ten years. There's been stretches of up to two to three years in between, so I wouldn't say I'm overly experienced. My program of choice is Photoshop CS2, and that's been the case ever since I moved on from Paintshop Pro 7 several years back. I probably won't upgrade to a more recent version of Photoshop any time soon. I've tried them, but nothing about them have made me want to purchase those over CS2, so. Anyways, here's an example of a lot of my previous pieces... Really Old Stuff: Random Tags #1: Random Tags #2: Random Tags #3: Large Pieces: Music: James Hetfield: BRAIIINNNNS Real Welsh Ale: Assassin's Creed: Galactus Wallpaper: Sherlock Holmes: Deadpool: Some Anime Person: Mock Album Cover: Batman Characters: So, holy crap. There's a lot of stuff there if anyone cares to take a look through it all. Most of it is pretty dated, the most recent of those being from a few months back or more. I don't really remember. But anyways, I'm always welcome to people saying what they think of these.